2-Prs. 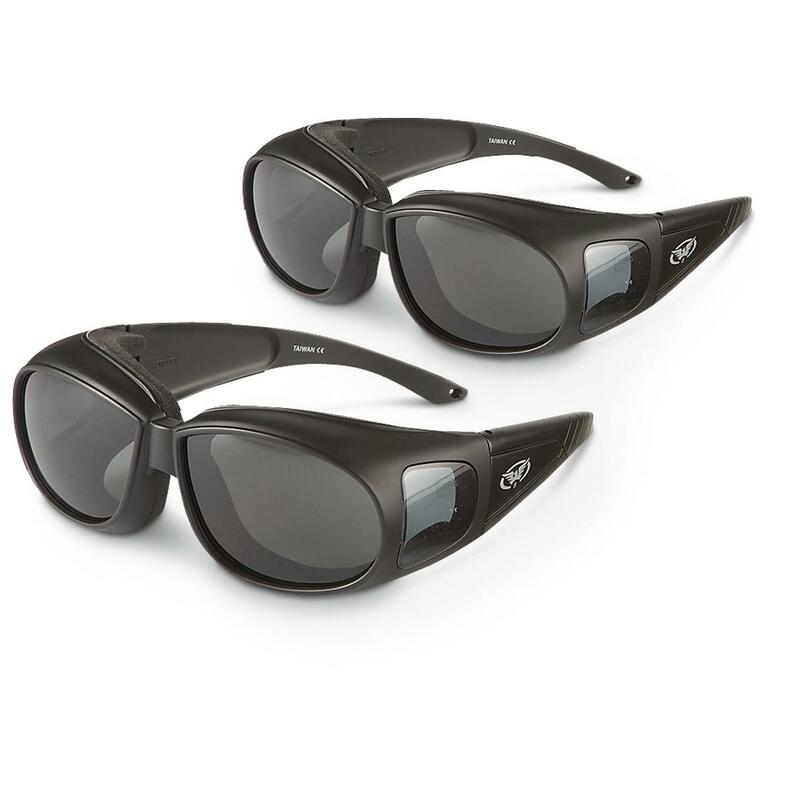 of Outfitters Overtop Polycarbonate Safety Glasses are impact and scratch resistant. SAVE BIG! Easily fit over your regular prescription glasses! Safety first! The high-tech composition of lightweight, durable, thin polycarbonate lenses provide comprehensive protection and eye comfort. In the shop, the clear lens Safety Glasses shield your prescription glasses from flying debris. Get the handy Strap to let them dangle on your neck when not in use. Save BIG now! Matte Black nylon frame. Each 1 oz. 2-Prs. of Outfitters Overtop Polycarbonate Glasses, Smoke is rated 4.3 out of 5 by 28. Rated 5 out of 5 by Highlander from Keeps the dust out I wear these while working on the tractor and they do a pretty good job of keeping the dust, etc. out of my eyes, even in the windy area I live. The fact that they come in a two pack works well for my father-in-law as he claims the extra pair for while he is working on his tractor. Rated 4 out of 5 by Printer from Better than goggles. These sunglasses were the ticket after my cataract surgery. I didn't want to wear a pair of goggles but I needed a something to shield my eyes from the wind when I ride my motorcycle. I don't know how they fit over glasses (don't have to wear them anymore) but that isn't the reason that I bought them. Good product and a good price. Rated 5 out of 5 by Craig from I LOVE THESE. I purchased these last year and am 100% satisfied. Perfect for driving into the sun. I use them in motor vehicles and ATV's They stay tight. No complaints. I am back here to order more. 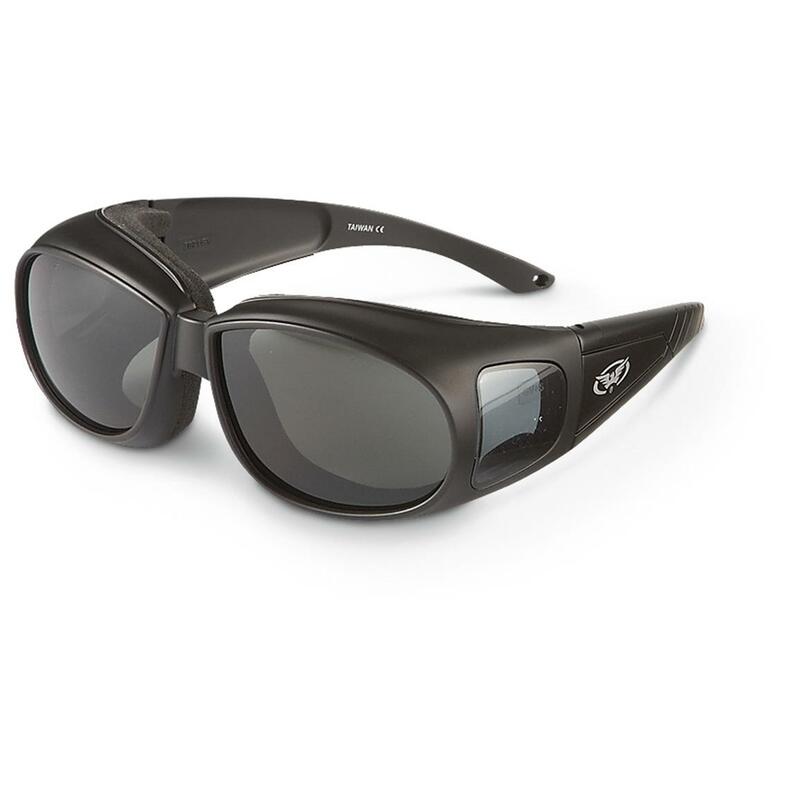 Rated 4 out of 5 by ovrTHhil from Ugly, but functional Light enough to not become uncomfortable when added over personal frames, provided the nose pads on your personal frames are broad enough to shed the load. Vision enhancement when driving into the blazing sun is as anticipated, an improvement. Wearing them when out and about is not what I wish to be seen wearing. Great eye protection when driving. Probably wouldn't work if I were on horseback. Keep one in all the vehicles I drive for those occasions when driving without them would be hazardous to anyone nearby on the open road. Color rendition is warm to brown, with the anticipated reduction in glare. Probably overkill if you wear those mini spectacles with lens that are wider than they are tall. Rated 4 out of 5 by Spike from comfortable fit Fits well over my medium sized glasses. There is foam on the plastic that fits tight against your eye brow. This restricts air movement and can make it feel hotter. Since it has to be large enough to fit over your glasses...I think they are geeky looking but I don't really care because they are functional.